The Massachusetts senator continues to shine light on Washington's cozy relationship with Wall Street and its too-big-to-fail banks. Elizabeth Warren does great email. One payoff of my pittance of a contribution to her grass-roots funded campaign—I regret not contributing more—is that I am regularly alerted by the new Massachusetts senator to the favoritism of our Congress toward Wall Street. “The federal government is profiting off loans to our young people while giving a far better deal to the same Wall Street banks that crashed our economy and destroyed millions of jobs. That’s why I’ve introduced the Bank on Students Loan Fairness Act as my first bill in the Senate: To allow students to borrow money at the same rate as the biggest banks. The justification of near zero rates of interest for the banks is that they will make loans available that will stoke the economy, but quite the opposite has happened. The banks have been slow to make housing and business loans while feathering their own nests with outsized executive bonuses and costly acquisitions of other financial institutions. In contrast, student loans amounting to more than $1 trillion exceed the total outstanding credit card debt in the U.S. and represent a major contributor to consumer purchasing power. Students actually spend their loan money on surviving as consumers in a tight economy, while learning skills needed for the economy of the future. On the other hand, the already too-big-to-fail banks have used the government’s free money to become even more obscenely powerful. Then, too, the federal government’s enormous subsidy to the banks extends far beyond the provision of low-interest money. The so-called quantitative easing program, now reaching into the trillions of dollars of government subsidy, continues at the astounding rate of $85 billion in Federal Reserve expenditures every month to take toxic assets off the books of the banks and to otherwise float the very financial institutions that, as Warren never tires of pointing out, caused the great meltdown of our economy. How astonishing to have a public servant who actually cares to inform the public about the inner workings of the system of crony capitalism that has wedded big government with big business. This comes at the expense of the free market that corporate lobbyists delight in invoking as an ideal while they subvert it as a reality. 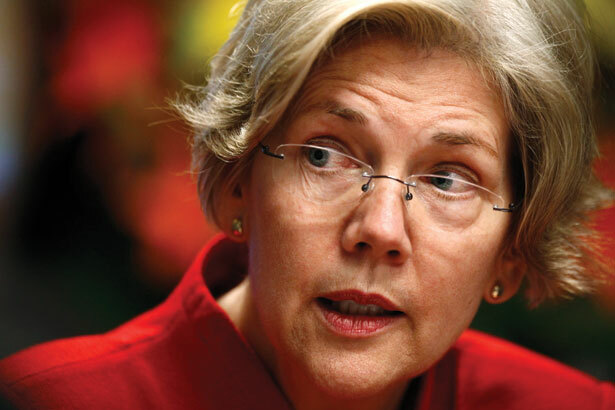 Those seeking to join Warren in taking a stand on behalf of students attempting to survive in an economy that the bankers have come close to destroying should get behind her bill. Unless Congress acts, student loan rates will automatically double in less than two months. They should also heed Warren’s call to aid the campaign of Ed Markey to fill the other Senate seat from Massachusetts made available by the resignation of John Kerry to become secretary of state. As a long serving member of the House, Markey distinguished himself by being a leader in the battle against the radical deregulation of Wall Street. Markey, as early as 1992 when he was chairman of the House subcommittee on telecommunications and finance, sounded the alarm on the danger of the unregulated derivatives in housing mortgages and other collateralized debt obligations that ended up causing the Great Recession. It would be great if Massachusetts, the home of the real tea party revolt, could now elect a second senator with a powerfully informed record of serving the consumer interest. As Warren put it, “Ed will fight for accountability on Wall Street—to end ‘Too Big to Fail’ and ‘Too Big to Jail’ once and for all.” She could use Markey’s help, and so could we. Read Robert Scheer on Barack Obama's nomination of predatory banker Penny Pritzker as secretary of commerce.